The expansive $5 billion American Dream Mall at the Meadowlands Sports Complex in East Rutherford, N.J., represents the next wave of Super Malls that look more like amusement parks than shopping centers. EAST RUTHERFORD, N.J. — With a quarter of malls in the United States predicted to close within five years, Canadian developer Triple Five Group is building a giant anti-mall in North Jersey, just outside Manhattan. The much-delayed $5 billion complex, modestly called American Dream, will resemble something straight out of a Walt Disney movie: a jumbo-sized hybrid between a shopping center and amusement park that some see as a model for what top malls are becoming. "The future of malls is that they will have to offer shopping experiences you can't get anywhere else in the form of food and beverage, unique entertainment opportunities, and exclusive stores," said JLL's James Cook, director of retail research for the Americas. "You certainly need something" unique. American Dream meets all the criteria, even if it's on its third builder and has endured multiple setbacks over more than a decade. "It will have less retail space than [the nation's largest] Mall of America and 60 percent more in entertainment offerings," said Debbie Patire, Triple Five's senior vice president of marketing. "But it really isn't about size these days. It is about the customer experience and having the right mix of components, flagship and new-to-market retail, combined with best-in-class entertainment, attractions, and restaurants." Phase 1 of American Dream was expected to open next summer. 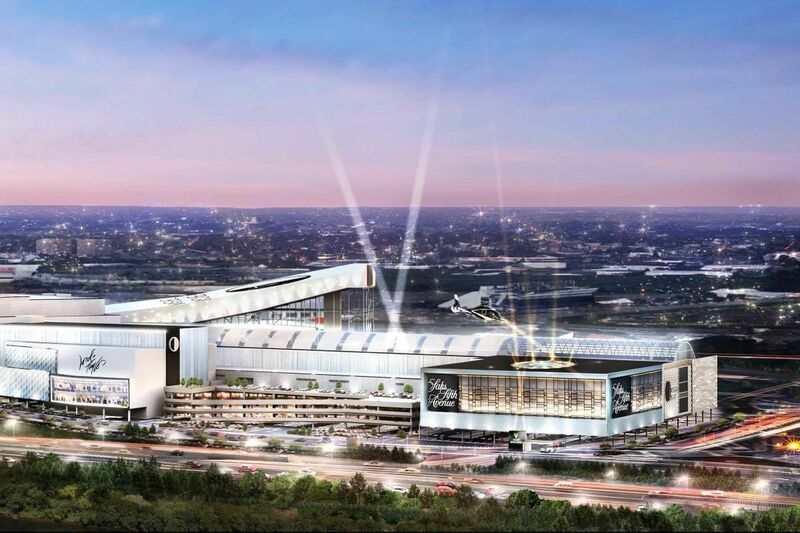 Now set for March 2019, it is rising beside MetLife Stadium, where the National Football League's Giants and Jets play. It will encompass three million square feet, with half devoted to 13 attractions, including a DreamWorks Waterpark featuring elements of "Shrek's Soggy Swamp," a Nickelodeon Universe theme park, and a 16-story Big Snow America Indoor Ski Hill. The $5 billion American Dream Mall represents the next wave of super malls that look more like amusement parks than shopping centers. Here, one of its premiere draws will be the Nickelodeon Center for families and kids. Should that bore you, there also will be a 1,350-seat live-performance Cirque Du Soleil theater, a Sea Life Aquarium, a Legoland Discovery Center, an 18-hole miniature golf course, an indoor NHL-sized ice rink, an observation wheel resembling the giant London Eye Ferris wheel, and dine-in cinemas with Cinemex X4D, which provides rain, snow, and scents linked to on-screen action. But wait – for shoppers, there's Saks Fifth Avenue, Hermes, Microsoft, Lululemon, Old Navy, and Victoria's Secret as well as fast fashion retailers H&M, Zara, and Primark, among 450 stores, specialty shops, and restaurants. Children's activity retailer KidZania committed to take 80,000 square feet. "It should become the preeminent tourist attraction, not just in New York, but in all of North America," gushed Don Ghermezian, whose family controls Triple Five. The family firm is also seeking approvals for American Dream Miami, which looks a lot like the Meadowlands project. What Triple Five is doing is akin to what Pennsylvania Real Estate Investment Trust (PREIT) is implementing on a smaller scale at its regional malls in Pennsylvania. The company has put a Legoland Discovery Center and a 5 Wits maze-like survival game at Plymouth Meeting Mall in Montgomery County, and a Round 1, a bowling alley/karaoke/gaming attraction at Exton Square Mall in Chester County, to replace traditional department store anchors that have closed. Willow Grove Mall will soon get an interactive escape room that allows patrons to solve mysteries. Integrating "social experiences for all ages is critical," PREIT chief executive officer Joseph Coradino said last week. "Malls are moving toward becoming full-scale lifestyle destinations … that will extend consumer visits and drive sales." Coradino said nearly 19 percent of space in PREIT's portfolio, including executed leases, is now committed to dining and entertainment, up by a third from five years ago. American Dream was conceived more than a decade ago by the Mills Corp., which then called it Xanadu. Mills envisioned coupling a traditional mall with a Ferris wheel and an indoor ski hill. But the project was beset by appeals and lawsuits from environmentalists against rival developer Hartz Mountain, and Mills sold off its share in 2006 to Colony Capital. Then Colony lost its funding during the recession and stopped work on the project in 2009. The two developers combined had sunk $2 billion into the unfinished project. Triple Five took over Xanadu in 2011, but didn't rename the mall American Dream until 2014. It would languish a few more years. On June 22, tax-exempt bonds worth $1.1 billion needed to complete the project were sold. That followed the $1.67 billion construction loan that was approved May 19, allowing Triple Five to resume building. This month, crews accelerated interior work on the Nickelodeon and DreamWorks theme parks, pouring concrete and laying the foundation. Jim Kirkos, president and CEO of the Meadowlands Regional Chamber of Commerce, noted that American Dream will sit at one of the most traveled intersections in North America, bounded by I-95, Route 3, and Route 120, which carry more than 110 million vehicles a year. "Thousands of jobs and incredible economic impact on the local, regional, and statewide economy will be realized," Kirkos said. American Dream spokeswoman Patire said more than 70 percent of American Dream Meadowlands has been leased. Experts are divided about the mall's prospects, given that an estimated 300 malls graded as second- and third-class are at risk of closing over the next five years. Traditional mall anchors such as Macy's and J.C. Penney have been getting hammered as more shoppers switch to buying online. American Dream's entertainment offerings are meant to make it internet-proof. So it "sits on the crossroads of where malls are going," said Jim Sullivan, president of Green Street Advisors, a real estate research firm. That's because under Phase 2, American Dream will double to six million square feet, betting on the hybrid playbook that Triple Five used for its two other megamalls. "There is significant retail competition within a 10-mile radius of that site, and to have a combination of a destination draw with entertainment along with traditional retail offerings differentiates American Dream and makes it a good fit for that location," said Mark Hunter, managing director at CBRE Inc., who oversees the firm's mall management work. "They have a good business model." But Brian Andrus, president of the Florida Gulfcoast Commercial Association of Realtors whose members have repurposed some malls, said American Dream will face challenges. "Every city, town, and area has variations and has varied needs and a separate culture," he said. "Regional differences must be considered." One is that on Sundays during football season, patrons will have to compete for parking with Giants and Jets fans next door at MetLife Stadium. Another is that, in Bergen County, blue laws still bar retail sales on Sundays. A third concern is how many will venture from the Big Apple to the Meadowlands to shop. Surveys show only 1 in 5 tourists who visit Manhattan – which has many of the same retailers as American Dream in Times Square and on Broadway and Fifth Avenue – head south to Lower Manhattan. The Meadowlands is eight miles farther. Still, New Jersey has its charms, including no sales tax on clothing and shoes. JLL's Cook says the site should attract "visitors in the area who are staying longer, especially those with families."